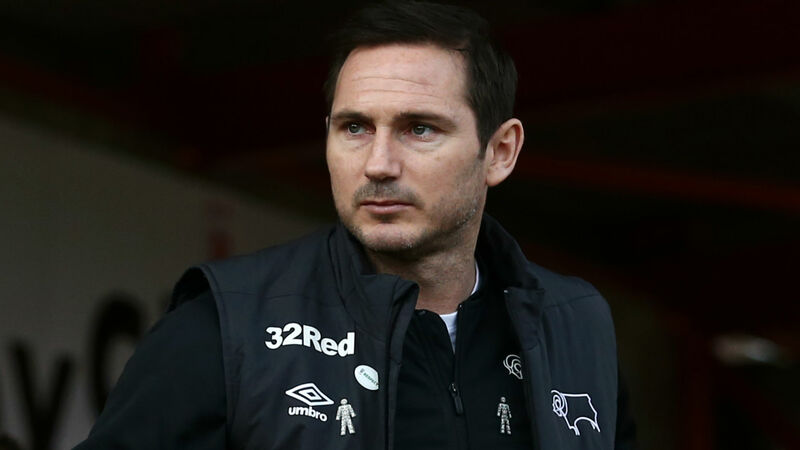 Frank Lampard has played down speculation linking him with a return to Chelsea, insisting he is only focused on Derby County despite being viewed as a candidate to replace Maurizio Sarri. The Blues were thumped 6-0 at Manchester City on Sunday, with a third successive Premier League loss on the road seeing them slip down to sixth in the table. For Sarri, it was the heaviest defeat of his coaching career and raised questions over his future. Even the Italian seemed unsure in his post-match press conference, admitting his job is always at risk. Unsurprisingly, bookmakers have Lampard listed as an option to take over should Sarri depart Stamford Bridge, yet Chelsea's all-time leading scorer hopes the current boss can turn around the team's fortunes. "With my Chelsea hat on, you have a feeling for it and it's not nice," the former England international told the media on Monday. "It doesn't happen to Chelsea much, so when it does, it's a shock. But let's not forget they were up against a great Manchester City team - and I also had some good times there as a player. "Bookmakers are not always right for starters, so I wouldn't get excited about that. Chelsea are certainly a club I respect and have a manager I respect. My job is here [at Derby] and I'm working very hard. "All my thoughts are on Ipswich Town away on Wednesday - I hope to see Chelsea put some form together and turn their results around."